This month has been crazy! Ford no longer seems like a baby but is growing into quite a cute toddler. He understands and follows commands, talks, and loves to interact with us. It's hard to believe he could get any more fun! 1st birthday invitations are mailed, pictures have been scheduled, and I sit here baffled that time has flown this fast. Prepare for a long post, Ford is doing so much this month! Health: overall Ford has been pretty healthy this month with a few runny noses and 2 days with a slight fever. I've been using Lavender, RC, Thieves, and Peppermint on him and only had to give him Tylenol once. We have his next well check on August 13th and hope not to visit the doctor before then. Teething: Ford has 4 teeth! He just had the bottom 2 for 2 months and the top 2 finally came in at the end of June. They are getting bigger everyday and it is so weird to see him with front teeth, so cute! No signs of other teeth trying to pop through. Diapers: cloth during the day, size 4 Huggies Overnights for nighttime. Eating (milk): Ford is now only nursing twice a day (right when he wakes up and right before bed) and we are working hard towards weaning at a year. We started giving him whole milk in a straw sippy last week and he loves it! He drinks 6-8oz throughout the day and I can tell he is losing his interest in nursing. We hope to be fully weaned shortly after his 1st birthday. Eating (solids): Ford sure doesn't miss a meal but he is getting picky as of late. Breakfast is his biggest meal and usually consists of a whole banana, piece of toast with jelly, and a carton of Greek yogurt. I have to save the yogurt for the end because that is all he wants. His favorites are yogurt, cheese, zucchini, turkey dogs, chicken patties, burgers, watermelon, cottage cheese scrambled eggs, bananas, and anything carb-y (crackers, puffy Cheetos, bread, croutons). Sleeping (night): Ford goes to bed at 7:30p and wakes up between 6:15-6:45a. If we try to put him to bed later, he will wake up earlier. Sleeping (naps): 1-2 hour nap at 8:30am and 1-2 hour nap around 1:30/2pm. He naps a total of 3 hours a day. Social: Like every other month, Ford is such a social butterfly. He smiles and waves and goes to just about anyone. 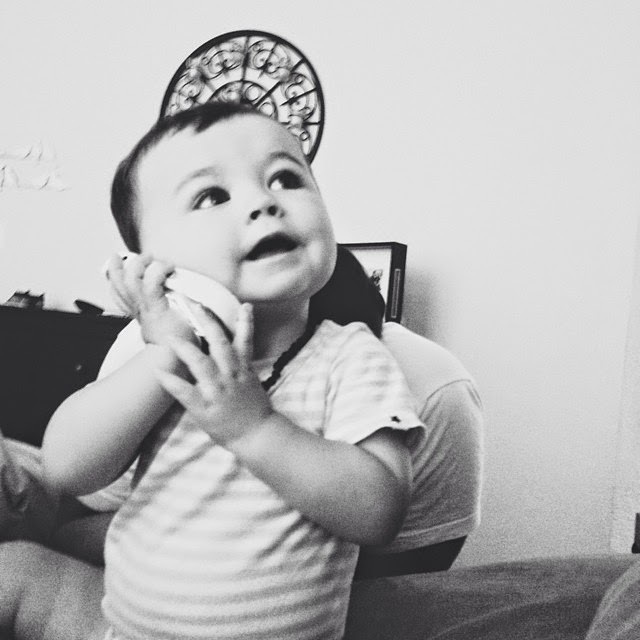 He is talking a LOT more these days saying "mama" "dada" "uh oh" "ba na" for banana, "muh muh muh" for milk. I swear he went from basically no words to full on babble in a matter of days. Dropping something and saying "uh oh"
Starting to recognize body parts. "Ford put it on your head" or "Wear it as a hat" and he will point to his head"
Twice this week when I dropped him off at the gym nursery he gave me the lip. I slowly tiptoed out and watched for a few minutes and he was fine, he usually loves it! Mama: I've teamed up with a bunch of other fabulous mamas and helped launch MOMquery this month! I am running social media for MQ and it has been a smashing hit, would love for you to check it out. I go through swings of emotion when I think about weaning but I know it is time. I am excited for the next chapter of our lives which will include being away from Ford for longer than 4-5 hours, ha! Daddy: we celebrated Jon's first Father's Day this month! Ford sure loves his dad, they spend a lot of time together playing so I can get some me time and I really appreciate that. Ford seems to laugh a lot easier at Jon than me! 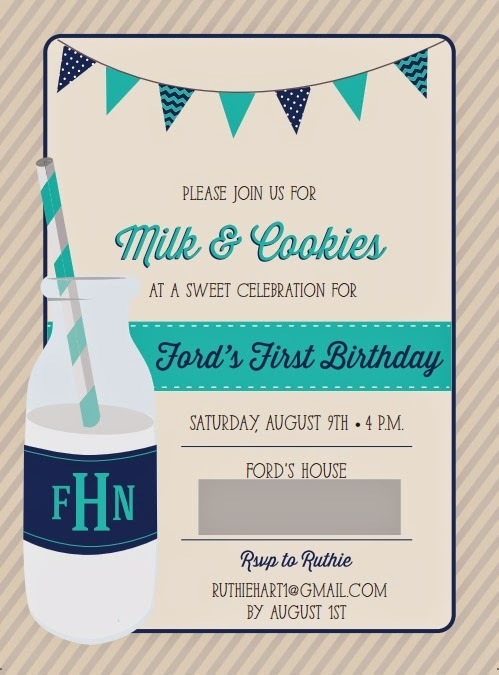 Finishing touches on Ford's birthday party! He is too precious and looks just like his mamma! Can't believe he's almost a year old! And still such a cutie!! ;) Love your updates. This is not happening. Our babies are not this close to not being babies. HOW DID THIS HAPPEN???? Seriously though... Ford is such a cutie! I could watch those videos alllll dayyy long! Happy 11 months, Ford! What a big boy!! Makes me sad and happy at the same time! So cute! He is so cute! My favorite picture is the top left from the swimming collage. I love Laura Morsman and can't wait to see the pics! I just LOVE this little boy, Ruthie! He is too stinkin' adorable. And it's always so fun to see how similar him and Lucas are...sounds like both of our boys sure do love to eat! Happy 11 months! He's so adorable!